Today's ultra-light notebooks, mini, and all-in-one desktop computers now have tremendous processing power–power that many thought would only be possible in full-size workstation or large desktop computers. Smaller in size and more portable, they're very desirable. For pros in the creative fields, processing power alone is not enough. A prime example is the new Mac Pro. Proven to be a processing powerhouse and packed with Thunderbolt 2 and USB 3.0 ports, it lacks the PCIe expansion slots necessary to install specialty cards to connect various video and audio inputs, for transcoding data, and to connect to high-speed storage and networks. 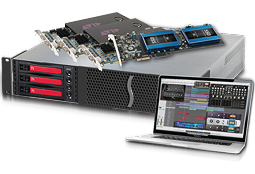 With the Echo Express III-R, Sonnet has created a solution that leverages the paradigm shift enabled by Thunderbolt technology, allowing PCIe expansion slots to be connected outside a computer. This rackmount Thunderbolt 2-to-PCIe card expansion chassis makes it possible for you to connect three professional video capture, audio interface, SAS or SATA HBA, 16Gb or 8Gb Fibre Channel, 10 Gigabit Ethernet, and RAID controller PCIe cards to any Mac® with a Thunderbolt port. The Echo Express III-R is Avid qualified. It has been tested and approved for use with Pro Tools HD 11 software, and is qualified by the Avid Audio group or use with Pro Tools HDX and HD Native systems and separately qualified by the Avid Video group for use with Media Composer/Symphony with the latest Mac Pro (Late 2013). See the AVID website for details on Pro Tools and Media Composer compatibility. 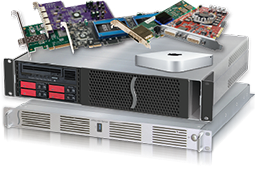 Sonnet's Echo Express III-R supports three full-size PCIe cards, up to 12.28-inch (full-length). The III-R integrates a universal 300W power supply and includes a 75W PCIe power connector for cards that require supplementary power, such as the Avid® Pro Tools|HDX or the RED® ROCKET-X. Even with all that power, the III-R is enviro-friendly; it automatically powers on or off whenever the connected computer powers on or wakes, or powers off or sleeps, respectively. The use of large, slow-spinning fans in the Echo Express III-R makes it a remarkably quiet operator. Two Thunderbolt ports support daisy chaining of up to six devices to a single port on your computer. 20Gbps Thunderbolt 2 technology-equipped computers are here. The original 10Gbps Thunderbolt interface has provided breakthrough bandwidth for external expansion, more than sufficient to support the maximum performance of most PCIe cards. However, some high bandwidth adapters such as the RED ROCKET, 16Gb Fibre Channel cards, multi-port 10 Gigabit Ethernet cards, or other bandwidth-hungry cards requiring more than 10Gbps. Thunderbolt 2 removes this barrier by providing more bandwidth for demanding applications. The Echo Express III-R's Thunderbolt 2 interface takes full advantage of this increased bandwidth to ensure optimum performance from installed cards when the chassis is connected to a Thunderbolt 2-equipped computer. Need to connect to a computer equipped with 10Gbps Thunderbolt? No problem, the Echo Express III-R is fully compatible with earlier generation Thunderbolt computers as well. Constructed of heavy-duty steel, the Echo Express III-R's enclosure not only provides secure mounting for the inner assembly and protection for the PCIe cards installed inside, but it supports maximum airflow for cooling, regardless of where it is installed in a rack. The fans are variable-speed and temperature-controlled, and the computer-modeled airflow management ensures that even hot-running cards and the chassis' components remain reliably cool without the need to install an extra PCIe blower card that would prevent the use of one of the three slots. Because the fans automatically speed up and slow down as needed, there is no guesswork in setting a switch position, and no need for tools to change fan speed settings. Since Echo Express products automatically power on and off with your computer, there is no power switch needed on the chassis. The III-R includes adjustable and removable rackmount extension rails that allow the chassis to be installed securely in a variety of racks from 16 to 24 inches deep. The III-R provides space for other equipment, too. Utilizing the optional Mobile Rack Device Mounting Kit, you can install two 5.25-inch form factor mobile rack devices (sold separately) in the III-R's enclosure without taking up additional rack space. The Echo Express III-R was designed to be remarkably quiet so that it can be comfortably used in noise-sensitive environments and it is indeed the quietest Echo chassis yet. Its dual, ultra-quiet, temperature-controlled fans assist the natural convection of warm air through the PCIe cards. Echo Express III-R's fans vent warm air through custom Venturi openings with low form-drag grills, resulting in reduced air velocity, turbulence, and, consequently, fan noise. 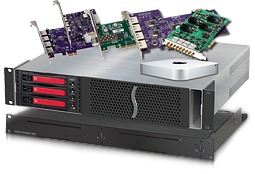 The Echo Express III-R supports three standard width, full-length PCIe cards, or one double-width, full-length card plus one single-width card, enabling it to support every Thunderbolt-compatible card available. 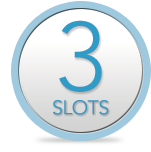 PCIe 1.1, PCIe 2.0, and PCIe 3.0 cards are supported. Do you have a card in mind but aren't sure it's compatible? We've worked closely with PCIe card manufacturers to provide a list of compatible PCIe cards on our supporting PCIe Card Thunderbolt Compatibility Chart. The chart provides an up-to-date list of cards that have been tested to be recognized over a Thunderbolt connection and compatible with Thunderbolt technology requirements. 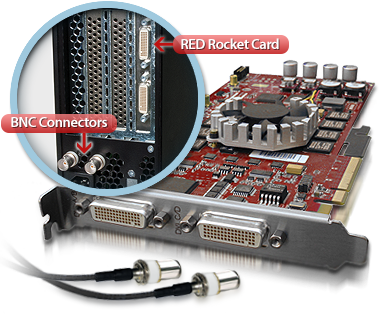 If you're a RED ROCKET, or RED ROCKET-X user, you already know that the card normally takes up two PCIe slots—one for the card itself and another for the BNC connector bracket (for HD-SDI output). Sonnet designed the Echo Express III-R to accommodate the card/bracket pair in a single slot. This Echo chassis includes mounting holes designed specifically for the installation of two BNC connectors, enabling you to install the RED ROCKET card in one slot and its BNC connectors in the Echo chassis' mounting holes, leaving the two remaining slots open. The extra bandwidth afforded by the Thunderbolt 2 interface significantly doubles the ROCKET's throughput, too. Designed for BNC Connector Cables—Echo Express III-R's back panel has two mounting holes for BNC connectors, allowing the use of a RED ROCKET card without the need for the BNC connector bracket that would normally occupy a valuable PCIe slot. The Echo Express III is available in two versions, the Echo Express III-D (desktop) and Echo Express III-R (rackmount), to suit your workflow needs. The III-D's form factor makes it easy to transport. The III-R mounts in a rack space 2U tall, and is just 16 inches deep, making it perfect for use in a wide range of popular mobile racks, carts, and rack cases, and server rooms as well. Using the Mobile Rack Device Mounting Kit, you can install two 5.25-inch mobile rack devices inside the III-R's enclosure and easily connect them to cards installed in the chassis. Connected to a 6Gb/s SAS host controller card, you could add an internal LTO 6 tape drive for backups plus an enclosure for four swappable 2.5-inch SSDs for fast storage. An alternate configuration might include a Sonnet Qio™ MR pro universal media reader (with its interface card installed in one of the chassis' PCIe slots) for quick ingests of files from SxS™, P2, and CF™ memory cards. Or, install a 6Gb/s eSATA host controller in one of the chassis' slots and connect one full-height mobile rack enclosure for three swappable 3.5-inch hard disk drives—you can migrate your old Mac Pro's drives to your new system. The Mobile Rack Device Mounting Kit includes an internal 100W power supply inside to power the installed devices, a large internal fan to cool the installed devices, and mounting hardware to secure the devices and the kit itself. To make your selections even simpler, Sonnet offers preconfigured kits that include the mobile rack devices, PCIe card, and necessary cables; you provide drives as necessary. No matter what you choose, the Mobile Rack Device Mounting Kit enables you to add more devices to your rack without taking up additional rack space. Mobile Rack Device Mounting Kit for Added Versatility—Add two 5.25-inch mobile rack peripherals to your Echo Express III-R. Install one full-height or two half-height mobile rack devices (such as an LTO tape drive and a Sonnet Qio MR Thunderbolt Edition pro media reader) using the optional Mobile Rack Device Mounting Kit. Sonnet includes a Thunderbolt cable to connect the Echo Express III-R to your computer, and a ThunderLok Thunderbolt connector retainer clip(3) to secure the cable to the Echo chassis. Thunderbolt connectors are held in place by friction, which works well in situations where equipment remains undisturbed while operating. But when there’s a chance of movement nearby, there’s a chance the Thunderbolt cable can be unintentionally unplugged, possibly leading to loss of your work or data. Sonnet’s ThunderLok prevents accidental cable disconnections from the Echo chassis, and is easy to install and use—just slide it over one end of the cable, and then plug in the connector and secure it to the chassis by turning a thumbscrew. 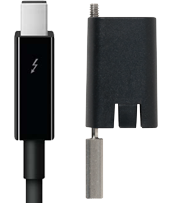 Because of its unique design, ThunderLok does not attach to the connector, but remains on the cable so it won’t get lost when not in use. Whether noisy PCIe card fans make it impractical to use the Echo Express III-R in a noise-sensitive environment, or because securing it in another room is required, you may find it necessary to put some space between the chassis and computer. No problem! Optical Thunderbolt cables, available in lengths up to 60 meters, enable you to locate your equipment where you need and connect the pieces without loss of functionality. Note: PCIe cards and Mobile Rack Device Mounting Kit sold separately. PCIe cards and Mobile Rack Device Mounting Kit sold separately. Power supply will operate at 90-115V AC, with linear power deration of 240W-300W over that range. You've had your Mac Pro for a while and it's served you well. It's time for a new computer, but you're reluctant to invest in the new Mac Pro. You'd consider a new Mac mini (they're quite powerful), but what about the assorted PCIe cards and 3.5" hard drives you've invested in over the years and installed in your existing Mac Pro? Sonnet's RackMac mini, Echo Express III-R, and its sidekick Mobile Rack Device Mounting Kit loaded with a 3-bay drive enclosure will make the Mac mini work for you. Just mount your Mac mini and a SuperDrive into the RackMac mini; with your PCIe cards installed, connect an Echo Express III-R via Thunderbolt cable; transfer your 3.5-inch hard drives to the mobile rack drive enclosure and—voilà! Now that the new Mac Pro is available, your decision about which computer to purchase to replace your existing Mac Pro may not be any easier. The new Mac Pro is powerful, beautiful, small, and very unlike previous models. With no space to install PCI Express cards or 3.5-inch hard drives, you can't just move things from one computer to the next…what to do? 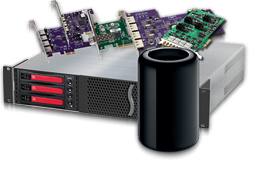 Sonnet's Echo Express III-R and its sidekick Mobile Rack Device Mounting Kit loaded with a 3-bay drive enclosure enables you to harness all the power the new Mac Pro offers while regaining the lost PCIe slots and drive bays. Just install your PCIe cards into the Echo Express III-R, connect the chassis to the Mac Pro via a single Thunderbolt cable, and then transfer your 3.5-inch hard drives to the mobile rack drive enclosure—your computer choice just became simpler! For many audio professionals, when it comes to multitrack recording at 96K, there's nothing like a Pro Tools|HDX (1, 2 or 3) setup. Until now, the workflow always required a PC or Mac Pro—big, bulky, and sometimes very loud. Change the game and utilize a streamlined system with a new MacBook Pro (with Retina Display) as your DAW and directly connect it to Sonnet's Echo Express III-R with Mobile Rack Device Mounting Kit. If you have a lot of tracks to record and an HDX 3 setup is required, the Echo Express III has plenty of power (including an internal aux power cable) and cooling to support all three cards. Or, if you only need an HDX 2 set up, fill the third slot with a Sonnet Tempo SSD PCIe drive card (holds up to two SSDs) to deploy super-fast Thunderbolt SSD storage. Mobile DIT carts carry everything from card readers and transcoding cards like the popular Red Rocket, to high-speed mezzanine storage, RAID arrays and LTO tape backup, but they are also large and cumbersome to transport. Our suggested alternative uses a Mac mini installed into an xMac mini Server, and racks it together with the Echo Express III-R and companion Mobile Rack Device Mounting Kit. With five PCIe cards connected to the computer, and space to install four shuttle drives or a Qio universal media reader plus an LTO-6 tape backup, you'll have fully loaded DIT station, all in a system that takes up just 3U of rack space.